To take a competitive market position founders face various questions: How do companies interact within a competitive environment? Which implications for strategic organization design can be derived? These and further startup challenges will be discussed during a live talk with Tobias Kretschmer who will also present some relevant research results. While startups will be in focus of the talk, insights are valuable for all types of companies and their managers. The live talk will take place at afk tv- Fernsehmacher von morgen (Rosenheimer Str. 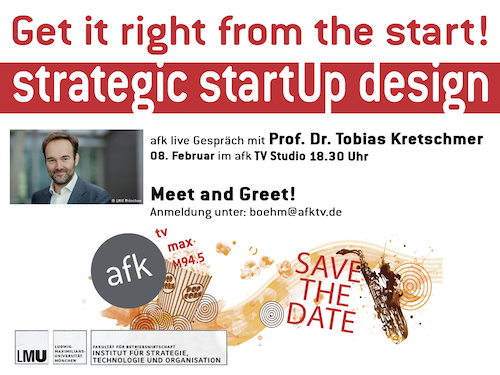 145, Munich) on Wednesday, February 8th at 6:30 p.m.. To sign up please contact Florian Böhm (boehm@afktv.de).